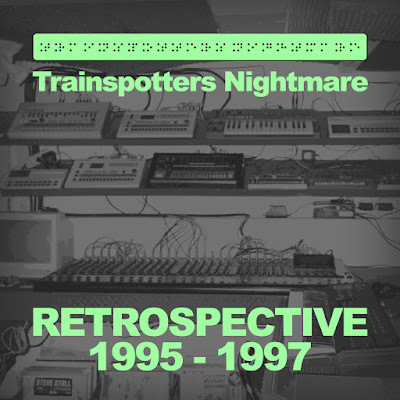 Trainspotters Nightmare was a label i used to run with Glenn Wilson of Planet Rhythm, between 1995-1997. It all started with me releasing an obscured 2 track black 12 inch vinyl with no visible title. An idea my friend Danijel Alpha had was to only inscribe the titles onto the vinyl itself, so no unauthorised trainspotters could see what records you where playing. And after receiving many interesting demo tapes from all corners of the world, a platform was needed where we could release trax that didnt fully fit on our labels H-Productions and P-Rhythm. So we continued and during the 2 years we managed to launch 13 vinyl releases, including special colored vinyls and double 12 inch albums. We realized that it would not be fair towards the other artists, if we didnt place names and titles on the vinyl centerlabels. This resulted in us addapting a Trainspotters Nightmare logo in Brail writing which suited the “Ghetto Booty” sound template of the label - being rusty, broken, skewed or even a bit out of sync. From Finland we have some truly exotic jacking tracks by Ari Jukka, Jori Hulkkonen and Tuomas Juhani. Austria is represented by V-Key from Vienna, that also had an amazing electronic dancemusic scene back in the 90s. Chicago pioneers Steve Poindexter, Gene Hunt and The Beatjunkies bring in the scent of legendary clubs like Warehouse and the Music Box. Besides my own name Cari Lekebusch there also are a few tracks released under my pseudonyme Mr Barth, and the Twobasementboys consist of me and Frankfurtian original freaknoisefunker Oliver Bondzio. @ the HPHQ Stockholm, April 2016.